This a is an “expansion” for the 25th anniversary of this great partnership card game. The game consists of 60 cards, 3 of which are devoted to rules. The remaining 57 cards are shuffled up and four of them are laid out in a display on the table. These Booster cards all have special abilities; and the color of the card’s border helps remind you when the card can be played and what the general action is. These Booster cards enter the game whenever Tichu is called. If it’s a regular Tichu, they are chosen after the current hand is complete. If Grand Tichu is called, they are added as soon as the cards are picked up. Once you hold them in your hand, you can play them at any appropriate time. There is no limit to the number you can have in your hand. Once played, the effects stay valid only through the end of the hand in which they are played in. Pothole – You can play a street that is missing a card. It can only be trumped by a street with a gap in the same spot (i.e. 8,9,J,Q,K would beat 2,3,5,6,7). You can – Ignore the Wish – from the Mah Jong this round. Rainbow – Four cards of different colours now count as a combination. They can only be beaten by another rainbow with a higher-rank lowest card. Ice Hockey Team – Five or six cards of the same colour now count as a combination. They can only be beaten by another ice hockey team with a higher-rank lowest card. Garbage Can – Tricks can now be beaten with other tricks that include them. For example, a 6 can be beaten by 66, 5566, or even 56789, which in turn can be beaten by 456789. The trick continues with whatever the last combination played was. Ties Are Winners – From now on, cards can be beaten not only with higher cards but also cards of the same rank. For example, a 6 would beat a 6. Enough! – No more booster cards can be played. Booster cards in the display or already played this hand still count. 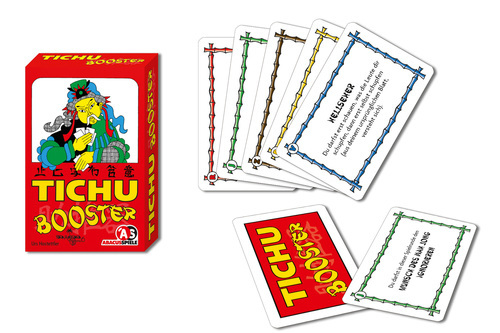 I have not yet had a chance to play the game with the Boosters – mostly because I’ve only now had them translated to English. I will have to check to see if there is any plans for an EN version of the cards. It certainly looks as if these new cards will add a heck of a lot of variance to the game. Is that a good thing? Who knows, I won’t be able to comment until I play them. 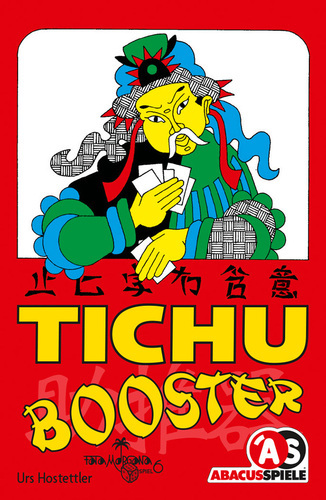 But I do love me Tichu – so I’ll likely be getting a set of the cards to try out! 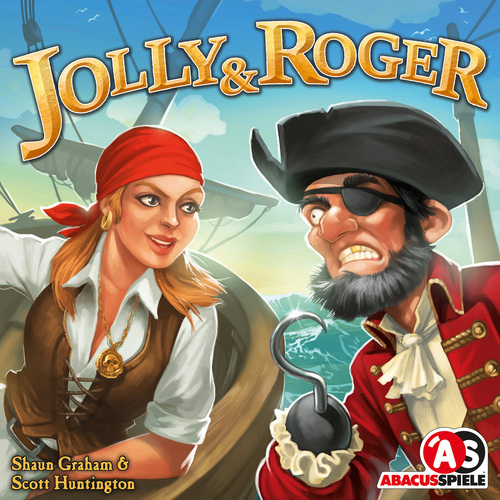 Jolly & Roger is a two-player game where players try to take control of four ships lined up between them. It uses the “I split, you choose” mechanic. There is a set of pirate tiles, with tiles in all four colors numbered from 1 to 5 – with a varying distribution in the different colors. Three of them are discarded, leaving 40 to play with. Each player gets 4 meeples in their color. On a round, the active player is the splitter. He draws the top 5 tiles and then splits them into 2 sets (i.e. either 4-1 or 3-2). The other player, called the picker, now chooses one of the two groups. He must then play all of the cards from his chosen set to the board. The tiles can either be used to reinforce the crew of a ship or to board a ship. The picker plays all of his tiles and then the chooser plays all of his. When reinforcing, you place the tile down on your side of any of the four boats. If the color of the pirate matches the boat, you can leave it colored side up – and it is worth the number printed on the tile (1-5). If the colors do not match, you must flip the tile over and use the white parrot side (which is always only worth 1 point). Now, you total up the points on each side of the boat, and whoever has more influence over the boat gets to put his meeple on that ship. If you choose to board the ship, you can only do so in a ship of matching color AND you must have control of it (i.e. your meeple must already be on it). In this case, the pirate tile is placed underneath your treasure pile marker. It will be worth a number of points equal to its value at the end of the game. The game goes for 8 rounds, that is until all the tiles have been split and played. 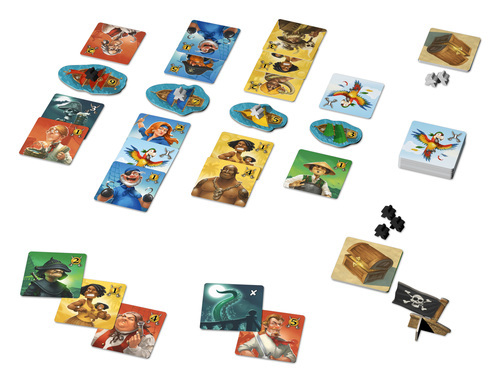 Players score points for each ship which they control at the end of the game in addition to the value of all their pirate tiles that were used for boarding during the game. I have played this once in a PnP version, and it is a tense little 2p game. I’m sure that having nice bits will enhance the experience over my little cut up pieces of paper! The picking and choosing mechanism leads to some difficult decisions – for both players! As you are splitting up the tiles, you have to be willing to accept either set, so you really do need to work hard to leave yourself something that you want in either bundle.